I was only lukewarm on fish as a kid and would only eat it in fishstick form, smothered in ketchup. But I grew to enjoy fish as I got older. It’s a good thing, because living in Florida meant ingesting a heck of a lot of fish. Fishing and boating and eating fish really is a way of life there. Oh, how I miss it. 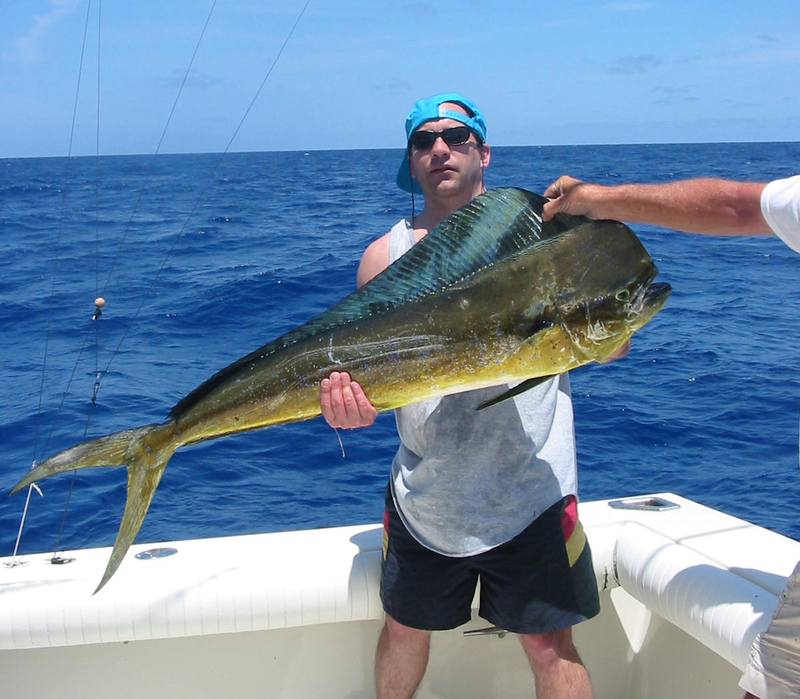 One of the main fish people catch and eat in Florida is mahi mahi. It’s a semi-firm, flaky, mild-tasting fish that has a pinkish color when raw, but turns pinkish-white when cooked. Mahi mahi is somewhat similar to swordfish, and typically is served grilled or blackened. It’s fantastic. Restaurants commonly serve it in sandwich form. 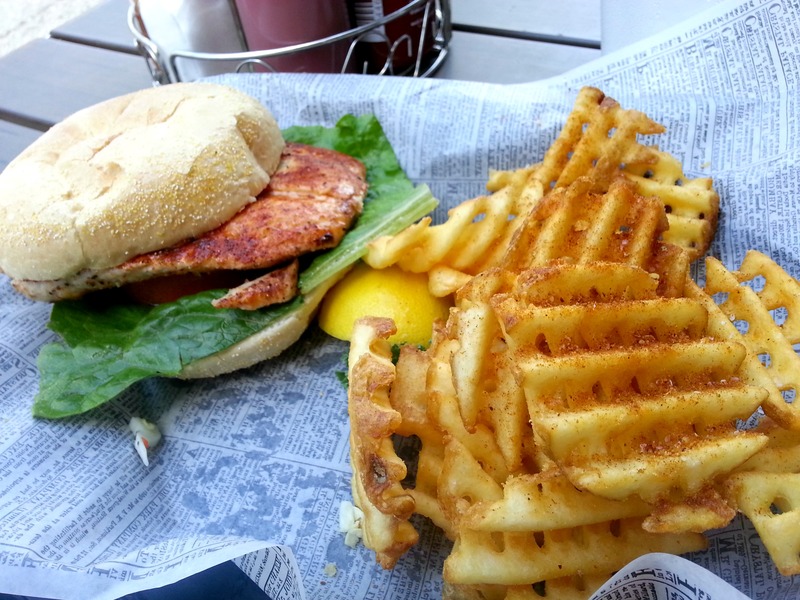 Go get a blackened mahi mahi sandwich immediately. DO IT. Living in Florida taught me that fish tacos also are a way of life. I love tacos and always have, but the idea of putting fish in there made me grimace at first. I remember watching person after person happily devour the grilled goodness while I turned up my nose in disgust. Then my friends Ariana and Max insisted I joined them in the fish taco eating instead of making fun of them (these are the same friends who made me realize I sort of like oysters and now can down them without gagging). Two words: life changing. Fish tacos really have gained popularity in restaurants in recent years and now I eat them all the time. Constantly. I seek them out at restaurants and make them at home. 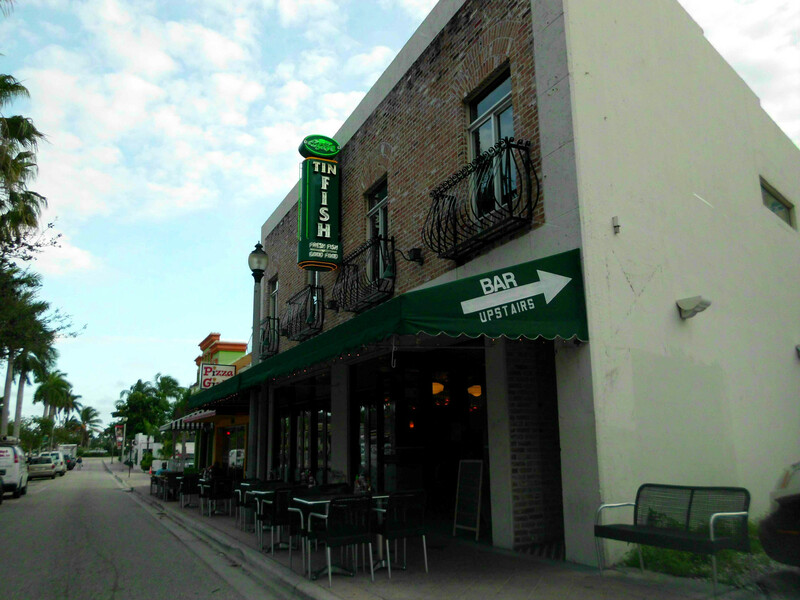 While recently in West Palm Beach, I upgraded from taco to giant fish burrito at Tin Fish restaurant. Let’s take a moment to pay homage to the beautiful fish that brings us the tasty offerings. Mahi mahi is also known as dorado, and more commonly in the United States as dolphinfish. Please note, this is NOT even closely related to dolphins, the mammals. The confusion caused me much stress as a child when dolphin-safe fishing was a big deal. I was horrified that my parents would eat dolphinfish because I was convinced it was the same thing as the cute, communicative dolphins everyone in the 1980s was so worried about getting caught in tuna nets. THEY ARE NOT THE SAME. Dolphinfish are, however, incredibly beautiful and amazing. They are brightly colored in blue-green streaks, have a prominent dorsal fin, and males sport a large, sloping forehead. My hubby adores them and gets giddy when we see a live one. Seriously, I cannot even explain his sheer joy just at the thought of a dolphinfish. He always says he wants to pet that big, sloping forehead. Weirdo. The other commonly spotted (and eaten) fish in Florida is grouper. Aficionados will be able to tell you differences between grouper and mahi mahi, but I think they taste very similar. Grouper does tend to be whiter and thicker than mahi mahi but is equally mild and delicious. Encountering a goliath grouper in the wild is like nothing else (note: goliath grouper is not the same variety of grouper people eat). I had such an experience while diving in Florida. I was investigating a shipwreck when I randomly turned my head to the left and saw a GIGANTIC fish looking me in the eye. I’m 5’5″ and the goliath grouper was longer than me and easily outweighed me by a couple hundred pounds (they often run around 400 pounds and can reach up to 800 pounds). Basically the grouper just wanted to say hi and then it swam away. Harvesting goliath grouper has been prohibited since 1990 because of a population drop. 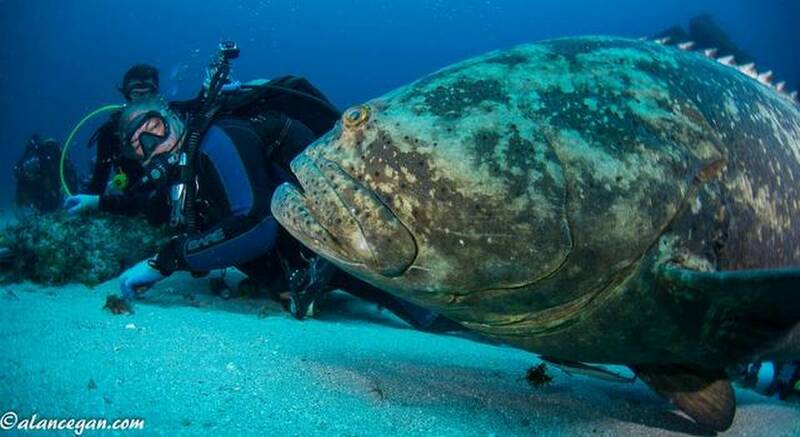 This spring, the Florida Fish and Wildlife Conservation Commission will finish its assessment of the grouper population and decide whether to allow a limited goliath grouper hunting season. I considered myself lucky when the hubby (who was supposed to be my dive buddy but instead swam off to check out the wreck) told me that grouper sometimes seek out interactions with humans. Sure enough, I researched the fish and found out they are naturally curious, territorial, and some divers even wrestle them. As in, stick an arm in the fish’s mouth, wrestle, and see who wins. That activity is no joke once you learn how powerful grouper jaws are. A couple years after my first grouper encounter, I watched a huge one create a distinctive WHOMP WHOMP sound every time its strong jaw snapped shut on unsuspecting prey. If you can imagine how hard it is to make noise and hear sounds under water, you can appreciate the power behind the chomp and how fantastic/frightening it is to witness. Let’s just say learning about the wrestling and the chomping made me feel pretty darn lucky that my grouper interaction only involved gazing into the fish’s eyes and not any bone-breaking contact. This is my favorite blog post of all time, on any blog, without exception. I am a huge Grouper fan. Especially with spicy seasoning or blackened! Well thanks, Dr. Camps A. Lot! That’s quite a strong statement about your fish love! I’m with you on the spicy seasoning… it’s the best way to enjoy grouper, in my opinion. Marylou, I’m proud of you for trying it! Be sure to avoid fried fish tacos, I don’t think they’re as good. The flavor of blackened is really good, so I’d start with that if it’s an option. Report back on what you think! Hopefully you will become as obsessed as I am!